Going inwards the ovule is made of: – Two integuments, the outer one being vascular. 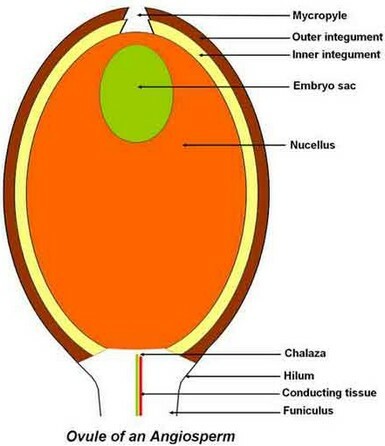 At the ovule apex, there is a tiny opening in integuments called micropyle. – The nucellus is a diploid parenchymatous tissue, surrounded by integuments and containing the embryo sac. If the nucellus is thin, the ovule is tenuinucellate; if it is thick, it is crassinucellate. – The embryo sac, the female gametophyte, is made of 8 haploids cells.